I first had this Curried Chicken Salad with Dried Cranberries and Toasted Walnuts at a networking event at a local Chamber of Commerce event that I attended several of years ago. It was so good, everyone wanted the recipe and now it’s a favorite of mine to use for leftover chicken. Along the way I’ve modified the original a bit with the addition of some dried cranberries and toasted nuts; while I love the splash of color they add which makes for a more attractive dish I also think it nicely elevates the taste too. Though I’ve made it with leftover grilled chicken breast I think it best when I buy or make a rotisserie style chicken and use a combination of dark and white meat. One whole chicken is just about enough to double the recipe if you are making it for a crowd. I always seem to be cooking food for a lot of people but today I decided to make this just for me and hide it at the back of the fridge. We’ve enjoyed this using turkey as well; especially after Thanksgiving when we have such an abundance of turkey and are craving something a bit lighter for dinner. Make the dressing; mix mayo and yogurt in medium size bowl and set aside. In a small skillet heat curry & oil over low heat until fragrant. Let cool and whisk into yogurt/ mayo. Put chicken, cranberries, toasted nuts, onion in a medium and gently combine. Season with salt and pepper to your taste and then chill for a couple of hours or overnight. I always served with red grapes on the side and though I didn't have any, it's really good with some sliced avocado too. I actually tasted a delicious salad like this at my grocery deli. I looked for a one just like it for a long time, until I found this one. Looks like it probably has about the same ingredients. Hope so, because I loved the deli one! So, when you say ‘curry’ is it a dry powder or is it a paste. I just want to know what I’m looking for when I go to find it. Sounds delicious. This was AMAZING and only got better with time….. literally ate it for like 3 days straight. Not sure about the onion part. Was it supposed to be green onions? I also added shredded carrots for extra nutrition. Will def make again!!!!! I actually use a mild white onion in the recipe and then just garnished it with some green onion so you could use either Val. So glad you enjoyed it…and a great reminder to me too. I love this salad and maybe it’s time for some new photos! “Good mayonnaise not salad dressing” was a good point to make in your recipe as I imagine the salad dressing version would totally change up the taste of this salad. It looks so appetizing and being as I practically live on varied salads over the summer, its a must try! 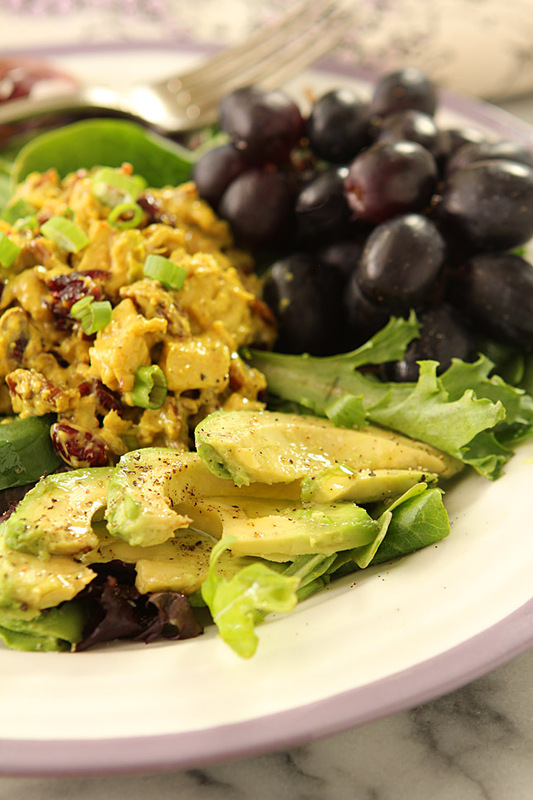 I love curried chicken salad but I’ve never tried it with dried cranberries. What a great idea! I am so happy to see this recipe. 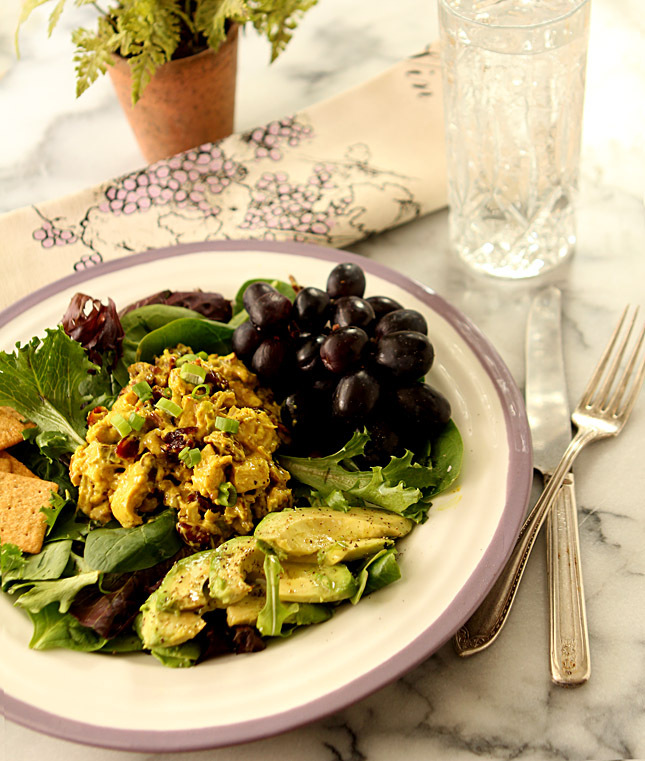 I lost my curried chicken salad recipe and kept trying to invent it, but it never tasted right. I like your idea of buying curry from a spice shop. Yours looks so good I want to eat it now!!! Let me know if you try it Joan; another reader recommended adding a bit of celery too…I might try that next go around. I highly recommend adding sliced celery to the salad. My local hot chicken takeaway makes a similar salad and the celery takes it to another level. Can’t wait to try out your recipe! I’ll try that; I may have done that in the past so now I’m even curious as to the difference; thanks. I love this! The curry flavor with dried cranberries and nuts! Why don’t I make great chicken salads like this. Great recipe, Barb! This looks great! Ive never cooked with curry before. I’ll have to get some and try it out sometime. Thanks! Curry is actually a blend of spices so when you go to get some, try to get some good curry spice. I love the spices from Savory Spice Shop and am so lucky they have local stores but they also offer all of their spices online; this one might be worth that effort! Well shoot! I’d be happy if my pictures turned out as good as the ones you think aren’t! No joke though… This salad looks great and I’d be eating every bite! Love the sound of this one, Barb! If only my Peter would eat mayo! Try subbing with yogurt or sour cream? Bit different result but I’m imagining still good. I’ve actually made a recipe that must be a distant cousin of yours! And one I’ve totally forgotten about. Mine definitely didn’t have dried cranberries or nuts — what a great idea! Glad you decided to revisit this, it’s a wonderful dish. Thanks. I have way too many recipes I did years ago that don’t even have photos…tons to revisit and guess what? Most are some of my favorites so happy to get them a bit more front and center and let others enjoy them too. Thanks for your (always) kind words John. Thanks Barb, I knew you had this recipe but had forgotten about it until I saw your post. Love it just as you indicate and am making for our dinner tonight!